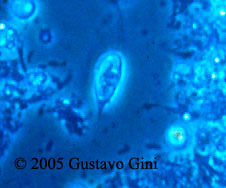 The cyst of Chilomastix mesnili, shown on the right, is pear-shaped and measures 4 to 6 µm wide and 6 to 10 µm long. There is a single nucleus and a curved cytostomal fibril called the shepherd's crook. The image at right is a trichrome stain (1000x). 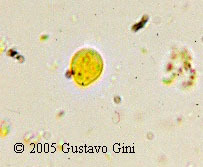 The trophozoites of C. mesnili are also pear-shaped and measure from 6 to 24 µm in length and 4 to 8 µm wide. The single nucleus usually has a prominent karyosome. The anterior flagella are difficult to see. The oral groove (cytostome) is sometimes seen near the nucleus. The image on the left is an iron hematoxylin stain (1000x). 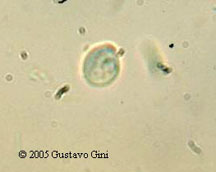 The image at right is a wet mount of a trophozoite viewed by phase-contrast microscopy. 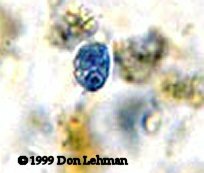 The image below left is an iodine stained wet mount of a cyst. 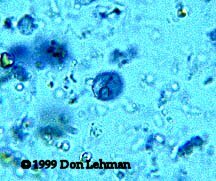 The image right is unstained wet mount of a cyst, the plane of focus is on the nucleus. Images courtesy of Gustavo Gini.